Newcastle top-scorer Loic Remy will miss Saturday's Premier League game at Stoke because he has failed to recover from a calf injury. The 27-year-old, who is on a season-long loan from QPR, was injured while playing for France in a friendly against the Netherlands last month. 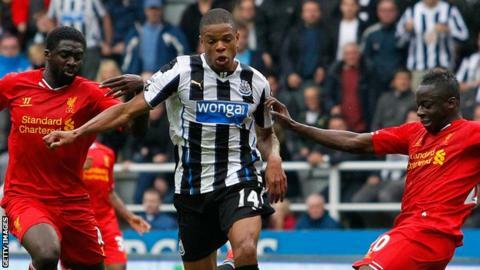 It had been hoped he was ready for a return, but manager Alan Pardew said: "Remy won't make this game. "We'd like to think he will make the next game." In the absence of Remy, who has scored 13 goals this season, Pardew must decide whether to continue with Papiss Cisse and Luuk de Jong in attack or bring in Shola Ameobi. Newcastle have lost four of their last five matches and sit ninth in the table with 46 points, seven behind fifth-placed Everton, who occupy the final European spot. "If we can get a win or score the first goal it will give us a boost to kick on," added Pardew. "We are far from finished in the league."